On October 15, 2012, Mark attended the 2nd Annual GAIN Investor Pitch Shootout at the Harn Museum Of Art on the University Of Florida campus. GAIN is the Gainesville Area Innovation Network, an organization that holds events that allow local scientists, engineers, developers, designers and entrepreneurs to network, learn, collaborate and socialize. 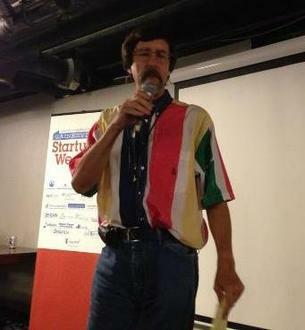 Mark was an observer who reviewed the exhibit of inventions and projects, listened to presentations on many aspects of technology development and commercialization and later watched inventors' and entrepreneurs' presentations, or "pitches," of their work to experienced technology entrepreneurs and investors. Following is an interview of Mark at that event. Mark continues to keep informed of the activities and events of the local innovation and entrepreneurship community through list services and occasionally attends those activities and events. Mark is shown pitching a business concept for an online collaboration and advocacy tool to all participants on the first night of Gainesville Startup Weekend. Gainesville, Florida, U. S. A.-- Mark joined the Silicon Sandbar innovation community during a recent business-forming event in downtown Gainesville at which he and fellow team members tied for third place for their promising, new business. 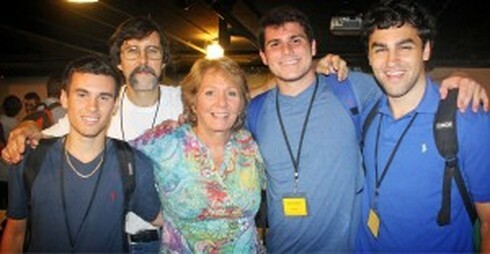 Over the weekend of September 28 to 30, the first Gainesville Startup Weekend occurred in various spaces in Sun Center East and in the Hippodrome Theater in downtown Gainesville. 125 participants converged on Gainesville from throughout Florida and Georgia and joined business formation teams that worked intensively throughout the weekend to create from inception new, mostly technology businesses. Of sixteen teams that formed Friday evening, twelve remained on Sunday evening. The eight-member, multi-discipline team on which Mark worked formed a new company called Nurses Report. Headed by founder, registered nurse, Betsy Potocik, the company will maintain an Internet site named Nurses Report on which nurses--those who best know and can best describe physicians and their work--will provide anonymous and authenticated reviews of physicians. Mark co-developed the marketing plan for the business and performed administrative functions. The panel of experienced, technology-entrepreneur judges declared that Nurses Report tied for third place after the end-of-event pitches on Sunday night. Organizers will award various prize packages to the first-, second- and third-place teams. All of those packages include memberships in the CIED business incubator, free entry into the GAIN Shootout business pitch competition and three types of free, business-related consulting services. The members of the Nurses Report team intend to continue developing their online physician rating service and launch it sometime in the coming weeks. You can read local business newspaper coverage of the event that extensively features Nurses Report here. You can read local newspaper coverage of the event here, here and here. This article is reprinted from the "NEWS" area in the center column of the home page of the Mark Venzke For Gainesville City Commissioner Internet site. 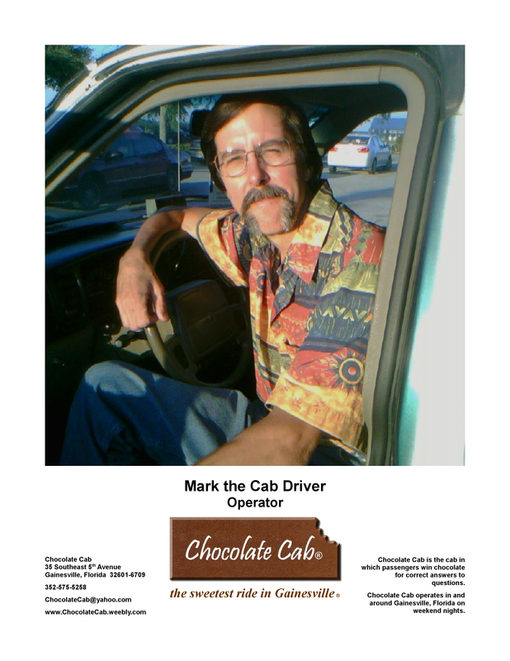 During the one and one-half years that Mark drove a cab in Gainesville, he developed and offered his "info-choco-tainment" service, Chocolate Cab. That service offered passengers individually wrapped chocolates for correct answers to Mark's questions. The service was wildly popular with college students who used his cab on weekend nights. Mark looks forward to someday reinstating Chocolate Cab service part time as a feature of a taxi company of his own that would use electric and alternate-fuel vehicles. Mark continues to develop the business plan for that company. You can learn about Chocolate Cab at the Chocolate Cab Internet site.